How to Restore iPhone without iTunes (iOS 12 or Earlier Supported)? How to Restore iPhone without iTunes Easy Fast? Tired of using iTunes for iPhone backup and restore that is both tedious and unstable? This article introduces to you the easiest method to restore iPhone without iTunes after iPhone backup for iOS 12 update or when switching to a new handset. This works with iPhone backups that you created with iTunes or using itself. You can simply restore iPhone fast and easy without the help of iTunes, now check out how! ★ Fast, smooth and no data loss when restoring. When Do You Need to Restore iPhone without iTunes? For every iPhone user who stores simply all his important data on iPhone, we recommend him/her launch a backup of iPhone data every other month, both for security reasons & in case (to backup and restore iPhone iOS 12, to prevent water damages, iPhone lost, or simple frozen iPhone). Though Apple has made it available for user to backup and restore iPhone with the help of iTunes or iCloud, it's often considered as an unpleasant experience to use iTunes, and especially on Windows, in that the tedious and lengthy process has proved itself to be not always reliable, running into such problems as iPhone not connecting to iTunes or iTunes problems on Windows. That been the case, it's important for everyone who wishes to restore iPhone without iTunes to find a reliable iPhone backup software that it is not only easy-to-use but also stable in performance when backing up and restoring. For that reason, DearMob iPhone Manager is one such tool to backup iPhone data and restore iPhone without iTunes. If you've ever tried of iPhone backup with iTunes, chances are that you'll find the logic of iTunes backup as user-friendly as any other Apple services except that you'll need to get through the software upgrade pretty much every time you use it. Fortunately, iPhone backup software DearMob iPhone Manager can achieve the same result as iTunes backup while guaranteeing you smooth backup experience and reliable restore iPhone without iTunes. 1. It can restore iPhone from backup made with itself. 2. It can also restore iPhone from encrypted backup made with/without iTunes, but you need to locate the backup location first. How to Restore iPhone via DearMob iPhone Manager? Step 1: Download DearMob iPhone Manager for Windows 10 or macOS Mojave, install and launch it, first USB-connect iPhone to computer to allow this backup software to access your iPhone data. 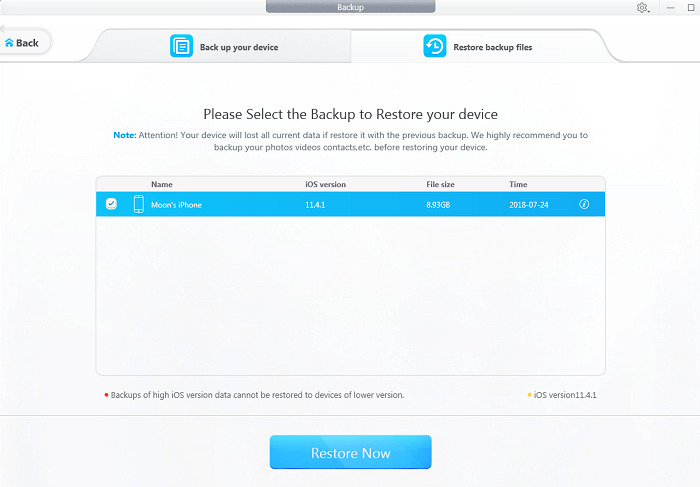 Step 2: Click on "Backup" on the main user interface, click on "Restore from Backup" in the backup window, which takes to previous iPhone backup data. Step 3: Choose the previous copy of backup that you wish to restore from, and wait for the tool to finish the process of restoring iPhone from backup for you. This method applies to those who wishes to restore not all iPhone backup but only a small part of iPhone data such as photos, music, videos, etc without the help of iTunes. Step 1: Also download, install and launch DearMob iPhone Manager, USB connect iPhone to computer to manually make DearMob iPhone Manager recognize your iPhone. Step 2: Find the backup files on computer that you backed up in advance, choose the correct type of iPhone backup data and click on Add or Import to retrieve the specific backup files to iPhone. Tips and Notes: Please remain iPhone connected to the computer when you are restoring iPhone without iTunes, also make sure that you use an original Apple USB cable for backup. As the best iPhone backup software 2019, DearMob iPhone Manager features probably the fastest iPhone restore utility among its peers: You can use it to backup iPhone to computer, or backup iPhone to Mac if you're running the Mac version, as well as selectively backup iPhone photos, music, vidoes, or backup iPhone contacts without hassle. For anyone who expects faster & smoother experience to restore iPhone without iTunes, this is a second-to-none choice throughout the year. Relying on DearMob iPhone Manager for iPhone backup and restore provides you with first-class continuity, you may get a safe backup of 12 types of iOS data using & restore iPhone without iTunes, now fully compatible with iOS 12.